The final cover for the paperback version of The Changing Room has arrived. You can see pre-barcoded version below. I think it's fantastic and on a par, if not better, than many of the traditionally published women's novels. It just what I wanted - something unique and with an almost seaside-postcard feel that will hopefully create interest from both men and women. I've added a little clothes tag-style ticket to the upper left-hand corner of the rear cover which reads " A book club novel." 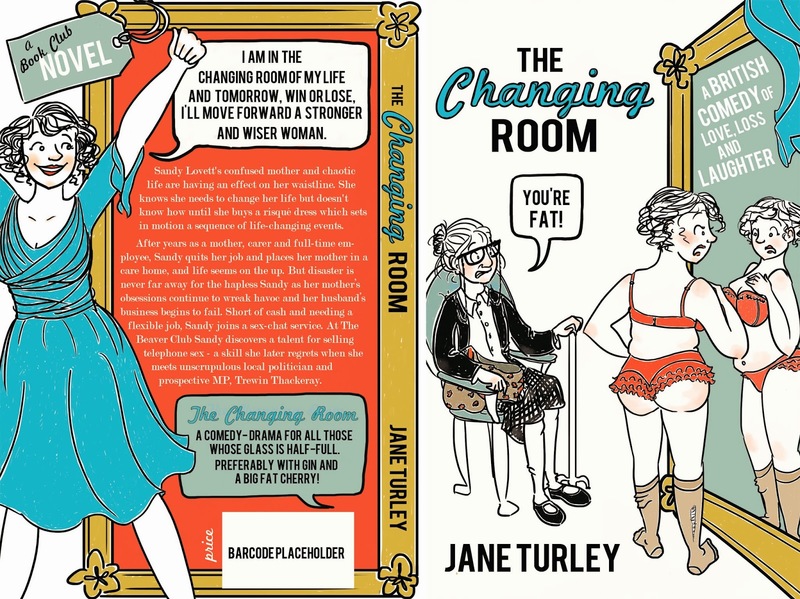 This is because I believe The Changing Room is an ideal novel for book clubs as it incorporates many themes for discussion. (Although probably not in my book club where we prefer to discuss the choice of wine and latest village scandals.) So I've also included a book club section at the rear which includes bullet points for discussion and a Q & A section with me where I waffle on in my usual dubious manner. The principle theme of my novel is "change" as suggested by the title. This is "change" as an individual that stems from the choices we make in our lives when faced with big decisions. In the case of my heroine, Sandy, these are crucial decisions such as whether or not to place her mother in a care home and how she will deal with the failing family business. But there are also deeper strands to the novel which I hope will open up discussion about how we deal with problems such as age and senility, not just on an individual basis, but also in the wider context of government and politics. The antagonist in my book, the unscrupulous local politician Trewin Thackeray, is another talking point whose dastardly behaviour I hope will generate conversation amongst readers about whether or not there should be "change" in the way MPs are recruited and how governments conduct their business. I suppose, ultimately, I've written a book I wanted to read and, interpreting my friends' favourite book club choices, what they might want to read too - a book which is light and fun but underneath addresses some serious issues. I've felt that this is an element missing from the women's market with publishers rarely taking a chance on "fun" fiction except when it's romance-oriented and, more often than not, in the chick-lit style. Jo Jo Moyes Me Before You is a rare exception to this but even that was a set within the boundaries of an almost-conventional romance. As for the comedic elements of my novel - from a personal perspective I feel I'm probably pushing the comedic boundaries much further than current mainstream novels. But that is the freedom that self-publishing has given me - to take a chance on what I believe women may enjoy reading and not feel constrained by agents' and publishers' preferences. Okay that's it for today. I only have to wait for approval and for the proof copies. Once I've approved them I can hit the publish button and a few days later the paperback will be available to order. In the meantime, if there's any of you out there who are book reviewers, librarians, are part of a book group or have a blog and would like to receive a free ebook, gifted via Amazon, of The Changing Room or A Modern Life in exchange for honest, impartial reviews on Amazon and/or Goodreads or on your blog please do get in touch via my contact page. I'm nearly there now. Phew. And just to keep you updated my next blog will be on a topic which is not close to my heart but definitely close to my sense of humour. It will be called French Trains and German Engineering. I haven't written it yet - but I have a feeling it might be a little politically incorrect. That cover looks fantastic. Kind of a throwback to the 70's eh?